Over the past couple months, I have been detailing the permitting of flaming by conservatives on conservative sites while punishing critics of the far right. Today, I came across another instance of Big Government flaming and censorship and thought I would share my findings. The string of comments and responses are from an article from Michael Zak, comparing President Barack Obama to Fascist Dictator Benito Mussolini - and they say liberals are the ones to draw comparisons to fascism. 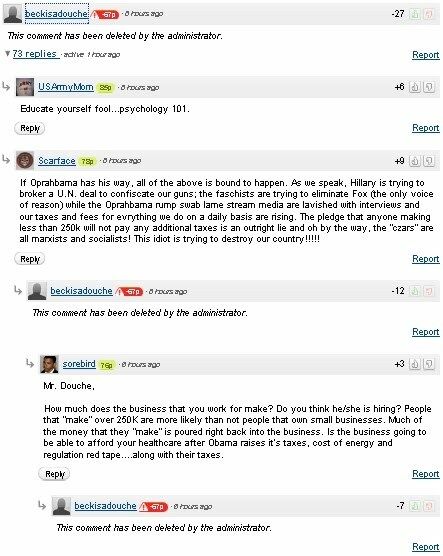 but then I came across a treasure trove of right-wing flaming permitted by the right-wing website. 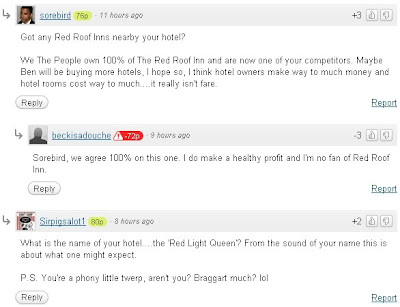 It began with a comment by a user who calls themselves "beckisadouche." 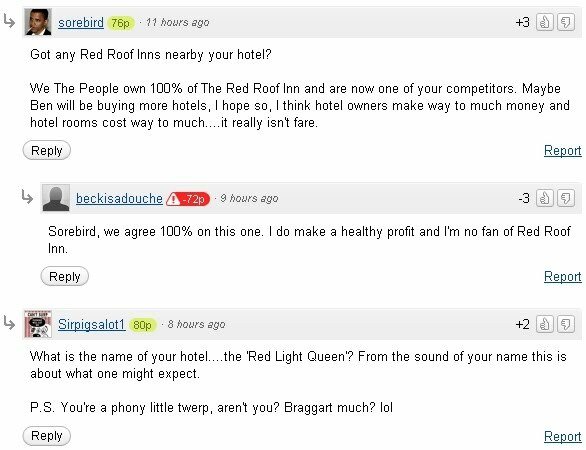 I had noticed that not only did beckisadouche have a negative IntenseDebate score, their comment had been deleted. To get a better idea of what they said, I scrolled down to view the responses, only to reveal even more deleted comments - 50% of the first 6 comments were deleted. I noticed that even my simple question to beckisadouche netted me some negative debate points - all I asked was what they wrote and a link to this website so they could leave their comments, should they meet the fate of so many other comments of theirs, and come to think of it, how many comments were deleted by administrators? Flaming. That is right. 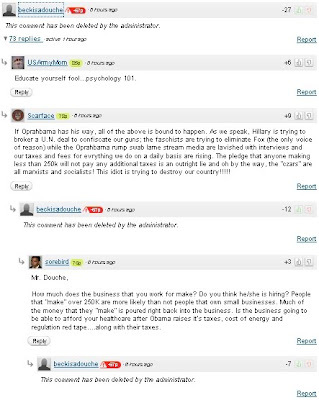 From Georgia believes that beckisadouche's comments were considered flaming because according to their opinion, the deleted comments offered up "worthless rants without facts backing them up." That pretty much sums up every Big Government article, especially the ones written by Jim Hoft. 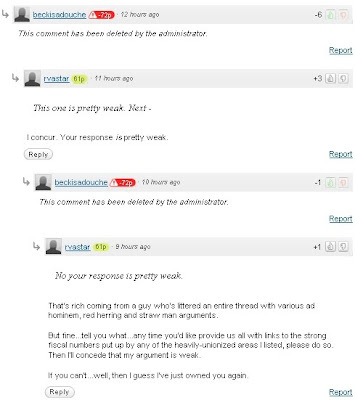 Big Government uses a software called IntenseDebate to permit commenting on their articles, but when someone tries to debate the issues, they are quickly attacked by the other users and then their comments are deleted, giving the appearance that the person critical of the fringe was being nasty, reaffirming the belief held by the right-wing that those on the political spectrum to the left of the far right are simple thugs. From Georgia obviously skipped over the numerous comments that offered up worthless insults directed towards beckisadouche that would be classified as flaming that were not deleted. This problem is not isolated. We see this happening all across the right-wing. Sure there are plenty peaceful conservatives out there, but think about the rhetoric coming from the Tea Parties and the GOP - they encourage this kind of behavior. As long as the Republican Party perceives the the Tea Party as solution to the Democratic takeover of both houses of Congress and the White House, the fringe will continue to enjoy increased attention, with their attacks becoming even more brazen. Update June 18th, 2010 - So... it looks like Big Government administrators actually deleted one of Sirpigsalot1's comments against me AND Sirpigsalot1 had apologized for insulting me when I told them that was inappropriate. While a mature gesture, I don't think this will cause a stop to the practice. Funny thing then, midnight, that you chose not to post those "negative debate points" in their entirety, isn't it? Now why would that be? Additionally, I also find it funny that you chose to omit the post where I illustrated that beckisadouche had been lying about his identity in the thread. 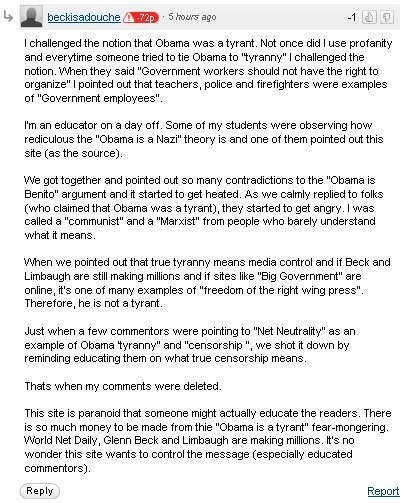 Or the fact that beckisadouche had been insulting posters as Limbaugh dittoheads while he himself was busy cutting and pasting - without attribution - entire paragraphs from other sites and passing them off as his own words. Any reason for leaving those little "inconvenient truths" out? By the way...have you had enough time yet to come up with a response to my question as to whether or not you'd describe a Republican candidate who's life-history included a "mentor" who was a life-long neo-Nazi, 20-years attendance at a Christian Identity church, and a political career that began in the home of Richard Butler as a "radical"? How about your "anti-incumbency movement" claim that I debunked? Had time to come up with a response to that yet? Now...let's see if you're actually intellectually honest enough to practice what you screech and leave this post up...as well as to respond to the points therein. Considering the facts so far - namely, that you're a liar in both fact and by omission - I rather doubt it. Not quite sure what you mean about that. I guess I can take a screenshot of the negative numbers for that comment if you'd like. 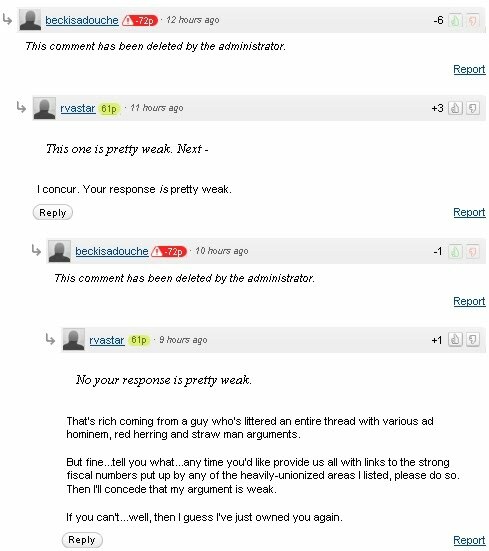 I am not familiar with a post where beckisadouche lied about his identity, but I will go back over the thread. As for the "Limbaugh dittoheads," I had not seen that comment but while that is an insult, it is hardly a personal attack like calling someone a "twerp idiot." If you think about it, beckisadouche was just stating that a lot of the Big Government talking points are copied or shared with Rush Limbaugh. Looks like I am intellectually honest, leaving your comment up and responding, and I don't think that I am a liar by fact and omission, and it is interesting that you mention lying by omission - isn't that what people like James O'Keefe had done with their little ACORN videos? Wouldn't that make you a hypocrite for supporting him yet attacking my alleged omissions or are you a person of flexible principles? For your first question, I assume you are trying to draw parallels to Reverend Wright and President Obama attendance to the United Church of Christ affiliate Trinity United Christ of Church . I think drawing comparisons to the predominately black church and someone who has their roots in with neo-Nazis and the Aryan Nations is a rather poor comparison and only illustrates your bias. Are the primaries any indication of the national mood? Maybe. Based on what happened during the primaries, I am led to believe that the anti-incumbency has been over exaggerated, but we will know for sure come this fall.